Just recently, we visited Mas Martinet for our forthcoming Priorat guide. It was a bit down the road from the village of Gratallops where we pulled in to their cellar and were immediately greeted by the ever-present and ever-friendly winery hounds. The doggie petting session was short though as our guide for the day, Magí Batllevell popped up. After hopping in to one of their rugged 4×4 trucks we headed up to their highest and most famous vineyard, Els Escurçons (named after a type of viper). It’s a hell of a road to get there with switchbacks and, as a passenger, that constant need to press your feet against the floor for the brakes as it seemed at any moment, the truck was going to plunge off the edge. But, Magí assured us that he was a professional (if such a thing exists for this type of driving) and we did indeed make it to the top in one piece. Was it worth the road? Oh god yes as the view from up there is simply stunning. 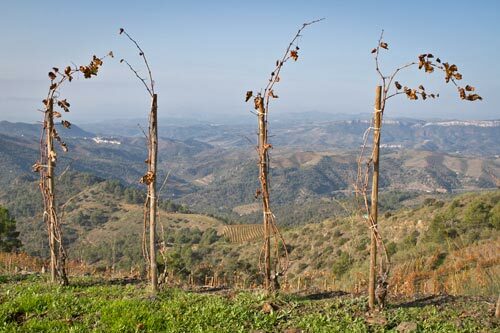 This vineyard, at 600m and pictured above, is apparently the highest vineyard in all of Priorat that still has the trademark llicorella (slate) soil that gives the wines from the region their signature flavor.